The PTTCDS7U turntable from Pyle has it all for fans of retro media, including vinyl and cassettes. 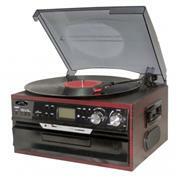 Plus, you can use this player to turn your wax and tape into digital MP3s. The USB and SD card slots serve two purposes use them to play back your favorite digital hits, or convert your vinyl and cassettes to MP3. A 3.5mm jack allows you to connect virtually any digital music player and hear it over the built-in speakers. There’s also an AM/FM radio and CD player with digital read out. Line out jacks allow you to add more speakers or integrate this player into your home audio system. Rotary knobs allow you to control everything, so the PTTCDS7U is the perfect mix of old and new technology.